Intel EXPI9301CT PCI-E / USB2.0 Netwerkkaart kopen? | That's IT! 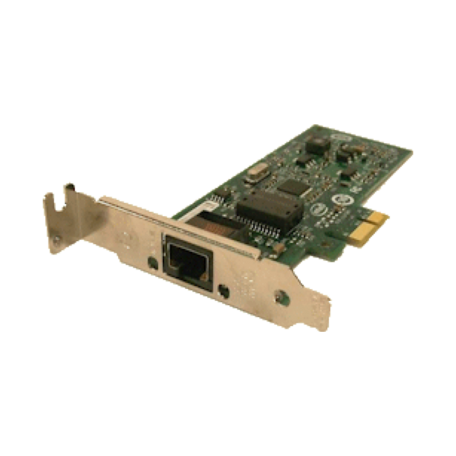 Professionele, door Intel geproduceerde PCI-Express 2.0 x1 server-netwerkadapter. Gebruikt maar in absolute nieuwstaat. Wordt bulk in antistatische verpakking geleverd. The Intel Gigabit CT Desktop NIC provides a complete end-to-end Gigabit solution from the server to the switch infrastructure and down to the desktop and workstation. Overall network reliability is improved by using Gigabit Ethernet. Just as networks migrated from 10-Mbit to 100-Mbit and gained a 10-fold improvement, the same will be true when moving from 100-Mbit to Gigabit. By alleviating congestion and removing bottlenecks, the network simply performs better. Gigabit Ethernet's dramatic increase in popularity is based on its scalable performance, flexibility, ease of implementation and lowered costs approaching 10/100 Ethernet. As the trend for bandwidth-intensive applications continues, the need for high-performance connectivity solutions will fuel the Gigabit transition. By bringing Gigabit to the desktop, many benefits are achieved for network administrators and for end users. Deploying Gigabit to the desktop is no longer an unattainable feat; it is a reality that is being achieved due to three items - affordability, ease of deployment, and performance benefits.